Silvered Mica are cut into specific shapes and thickness and thoroughly cleaned with the help of degreasing agents and are then silvered on both sides by screen printing process. We offer Silvered Mica Plates to our clients. These silvered mica plates are printed in multiple patterns as per the requirement in the capacitors in order to cut-down on the usage of silver and avoid its waste. In Silvered Mica Plates there is perfect adhesion between mica and silver which results in optimum performance of the plates. Variations on thickness of the silver deposited affect the dissipation factor of the plate, while the overlapping print area of the silver (electrode) and the thickness of the mica (dielectric) control the capacitance of the plate. 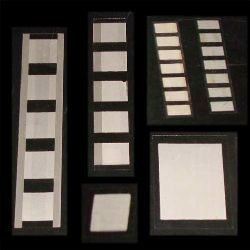 Individual plates are used in the manufacturing of single film mica capacitors. Looking for Silvered Mica ?